Youth Services Director Bob Twyver reports the following Student receipients for this years Rotary Scholarships. I had the privilege of attending the Carlton Awards luncheon on Tuesday. 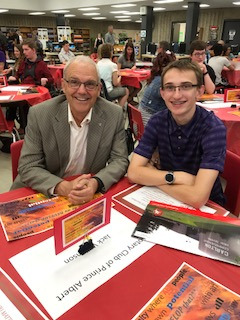 The recipient of the Rotary Club Citizenship Scholarship was a Grade 11 student, Jack Wilkinson. This award recognizes the school and community involvement of a Grade 11 student. The school indicated that Jack balances both school and community involvement as well a having a sincere desire to do for others. On Wednesday, Morley Harrison attended the Awards Ceremony at St. Mary and presented the Rotary Scholarship to Jayden Bissky. She was the Rotary Adventure in Human Rights participant last summer and spoke to our club about that experience. She too is a very deserving recipient. Rotarian Bill Tomyn represented our club at the last awards ceremony to be held at Blessed Marie Rivier School last week and presented the Rotary Scholarship to a Grade 11 student, Jenaya Fuller. Congratulations to all students for their accomplishments over this past year.